In this course, Prof. V. Rajaraman gives 40 video lectures on System Analysis and Design. Tools for systems analysts – data flow diagrams – case study for use of DFD, good conventions – leveling of DFDs – leveling rules – logical and physical DFDs – software tools to create DFDs (3 lectures). Control – audit and security of information systems – why controls are needed – objectives of control – techniques used in control – auditing information systems – auditing around, through and with the computer – testing information systems – types of tests – how to generate tests – security of information systems – disaster recovery – business process continuity (4 lectures). Electronic data interchange – EDI standards – virtual private networks – XML and EDI. (2 lectures). 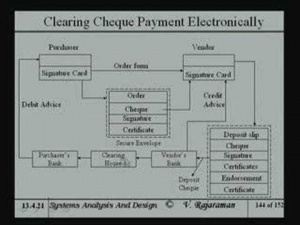 Payment systems in e-commerce – cheque payment, credit card payments, e-cash payments. (2 lectures). CosmoLearning is promoting these materials solely for nonprofit educational purposes, and to recognize contributions made by Indian Institute of Science (IISc) to online education. We do not host or upload any copyrighted materials, including videos hosted on video websites like YouTube*, unless with explicit permission from the author(s). All intellectual property rights are reserved to IISc and involved parties. CosmoLearning is not endorsed by IISc, and we are not affiliated with them, unless otherwise specified. Any questions, claims or concerns regarding this content should be directed to their creator(s).